Similar to the way Schwab pioneered low-cost trading a few decades ago, Betterment has pioneered the idea of placing your investments on auto-pilot. It didn’t take long for Schwab to see how much customers loved the ease and automation of robo-advisors and soon it launched Schwab Intelligent Portfolios to cater to hands-off investors. 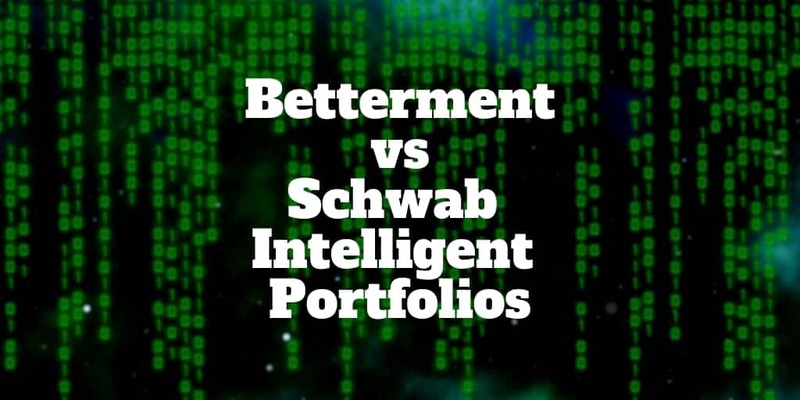 The differences between Betterment vs Schwab Intelligent Portfolios are small but they do exist so let’s take the plunge and see who comes out on top. What Is Schwab Intelligent Portfolios? Which Robo-Advisor Is Best: Schwab or Betterment? There is no question that Betterment deserves its title as a robo-advisor leader. Costs are rock bottom and services are top notch. Lots of bells and whistles are included in both service tiers. For example, behavioral finance methods are used to support goal-setting and help clients invest rationally. And fractional shares are used to ensure clients are fully invested. It is also possible to invest in socially responsible portfolios so your money is aligned with causes you care about. Year-end philanthropic tax deductions are also easy to automate thanks to its charitable giving platform. Betterment has even more to offer but first let’s take a look at Schwab. Charles Schwab offers the whole gamut of trading and investing services. From DIY trading to fully managed services, Schwab does it all. For hands-off investors who don’t need human advice, Schwab Intelligent Portfolios is a low-cost automated investment management service. The investment minimums are higher at Schwab than at other robo-advisors but the fees are much lower than Betterment, Ellevest, Personal Capital and other leading rivals. Most robo-advisors compete on management fees and Betterment is no different. It charges just 0.25% for basic service and 0.40% for its higher tier service that provides unlimited access to financial consultants. But management fees aren’t the total costs clients pay. Fund investment expenses are passed on by Betterment to clients – a standard practice among almost all financial advisors. Including both management fees and investment expenses, the total fees at Betterment average between 0.38% → 0.53%. Schwab stands head and shoulders above its competition when it comes to fees. Management fees are waived entirely. The reason Schwab can afford not to charge management fees is client portfolios are populated with Schwab’s own funds, which is how it makes money. Betterment does not enjoy this luxury because it relies on Vanguard funds. Investormint Verdict: You can’t beat zero! Schwab’s no-management fee policy gives it a clear edge over Betterment. While Betterment permits anyone to give its basic service a whirl, Schwab raises the bar to $5,000. The hurdle is high for Betterment Premium customers who must come up with $100,000 before gaining unlimited access to financial consultants. Investormint Verdict: Betterment wins this category by requiring no investment minimums. As you might expect from one of the best robo advisors, Schwab offers a tax strategy called tax-loss harvesting. The “gotcha” is it’s available only to clients who invest a minimum of $50,000. In sharp contrast, Betterment offers tax loss harvesting free to all clients regardless of the amount invested. The service is only applicable to taxable accounts and offers a way to pay Uncle Sam less than otherwise because losing positions are sold to offset the gains from winners, and the losers are replaced to keep portfolios diversified. Betterment goes a step further and optimizes for tax considerations across taxable and retirement accounts. Tax coordinated portfolios are used to place tax-efficient funds in taxable accounts and tax-inefficient funds in tax-advantaged retirement accounts. Performance returns can increase by as much as 2.66% on average as a result of these tax strategies, according to Betterment. Investormint Verdict: No two ways about it, Betterment wins the tax battle with Schwab. Investormint Verdict: Schwab edges out Betterment in terms of account selection but Betterment will serve the needs of most investors. Almost all robo-advisors these days build portfolios that abide by Modern Portfolio Theory, which aims to maximize returns for each level of risk. To achieve this lofty goal, robo-advisors need to be able to select from a wide variety of exchange-traded funds. Client portfolios are invested in up to 12 asset classes at Betterment. For the most part, Vanguard ETFs are used. Schwab offers over 50 ETFs from up to 20 asset classes, giving it the edge at first glance. What isn’t clear from the number of ETFs available is how well funds perform when stacked against each other. It’s possible that Vanguard funds outperform Schwab funds, or vice versa. For now we’re left simply with a like-for-like comparison on selection. Investormint Verdict: We award Schwab the victory in this category by offering almost double the number of asset classes. ✅ Low Fees: Zero management fees beats the competition. Few robo-advisors can stand toe-to-toe with Schwab on overall costs. ✅ Investment Minimum: Schwab loses out with a $5,000 minimum compared to zero at Betterment. ✅ Account Selection: Investors with more complex financial situations will do better at Schwab because it supports custodial accounts and SIMPLE IRAs in addition to taxable and retirement accounts offered by Betterment. ✅ Tax Strategy: Although Schwab offers tax-loss harvesting, it is only available to clients who have account balances of $50,000 or more. Betterment has no such restrictions. ✅ Investment Strategy: Almost double the number of asset classes are available for selection at Schwab, allowing investors spread risk more widely. ✅ Tools & Services: Retirement tools, charitable giving services, and socially responsible portfolios are all offered free to Betterment clients. ✅ Customization: Schwab gives clients control over how their portfolios are allocated. So too does Betterment, but only when they become Premium clients. ✅ Human Advice: All Betterment clients have in-app messaging access to financial consultants and Premium clients also have unlimited phone access to financial experts. Few robo-advisors compare well with Betterment but Schwab Intelligent Portfolios is that rare robo-advisor worth seriously considering as an alternative. Zero management fees, control over portfolio allocations, a wide variety of asset classes, and a broad account selection are a handful of the attributes Schwab has to offer. You can’t go wrong no matter whether you choose Schwab or Betterment, but we award Betterment the victory. Its low investment minimums and free tax strategies available to all accounts are just the beginning of its enticing offering. Clients can invest in alignment with their values using socially responsible portfolios. They can donate to charity automatically using the charitable giving platform. And retirement calculators help investors stay on track for their golden years. Plus, Betterment even includes behavioral finance techniques to optimize for goal-setting and account management. As much as Schwab has to offer, Betterment has just a little more and earns the overall victory.